Retold from the Retold from the Classic Tales original. 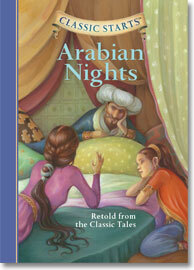 Ali Baba and the Forty Thieves, Aladdin, Sinbad the Sailor: these are just some of the strange and amazing stories that clever Scheherazade tells to captivate her husband, King Shahryar…and to save her own life. Each one is more fantastic than the last, filled with demons and dervishes, caliphs and genies, men transformed into dogs and monsters with eyes that glow. Like the king, children will find themselves enchanted by every tale.